Updates, congratulations and an apology! A big hello to all and I’ll start with an apology. I am sorry that I haven’t been posting regularly for the last month or so. I have been flat out training, teaching, attending seminars, building my business and helping one of my students get ready for his first mma fight as well as helping prepare some of my students prepare for the 7th Annual Australian Submission Wrestling Championships! Dont worry I’m back on track and will hav a ton of new material on this month, starting within the next 24 hours! The Jiu jitsu Kingdom blog is only going to get bigger and better from here on out as we introduce technique sections, more interviews, training articles and much more. I’m very excited! -Marcus “Man Child” Flanagan made his mma debut on CFC on friday 12th March. Unfortunately the fight didn’t go our way although Marcus showed some great takedowns and ground and pound. It was a tough first match up against more experienced opponent on the biggest show in the country although Marcus showed the heart of a warrior, the referee stopped the fight with 15 second left in the first round. As his coach and friend I am very proud of him and I feel sorry for Man Child’s next opponent when he comes back better than ever! 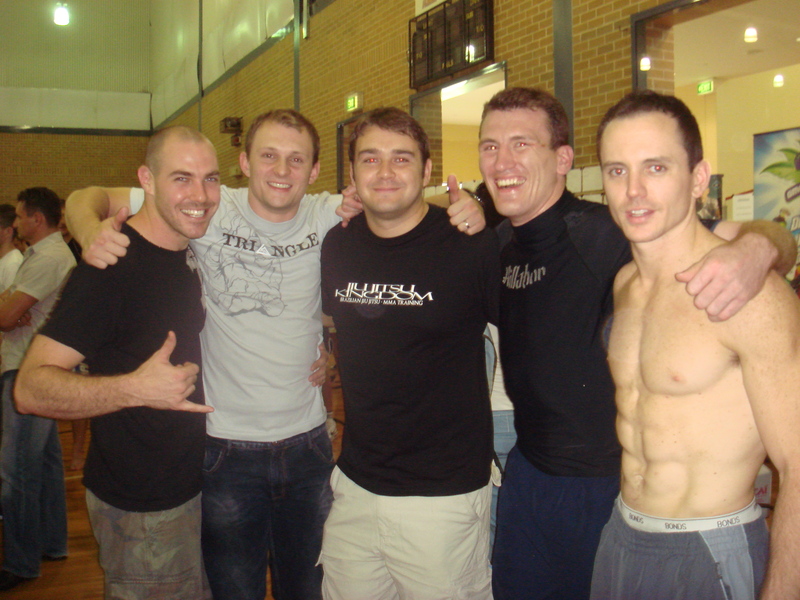 -At the 7th Annual Australian Submission Wrestling Championships on Saturday 13th March, I had three of the guys compete(all first timers to no gi competition). First up in the Under 73kg division was Ryan Daniels in which he won his first match by guard armbar, his second match by huge points margin (15 or 17-2 I think? ), his third match by armbar from mount before being defeated 6-4 in the semi finals taking fourth place. In the 79-85kg division Karl Robertson won his first match by a huge points margin (19-4 I think?) and followed that up with a head arm choke from mount in his second match before losing a points decision to fellow Jiu jitsu Kingdom representative Richard Peard in the quarter finals. Finally in the same 79-85kg division we had Richard Peard win his first and second match by rear naked choke, his third by points against Karl Robertson, his fourth by rear naked choke after surviving a deep guillotine, then a dramatic come from behind guillotine victory in the final as he was down 5-0 on points. I am so proud and happy for all the guys, they put on a great performance today! Jiu jitsu Kingdom team shot. From left to right is Karl, Michael, Felipe(me), Richard, Ryan. All in all, a great weekend and I am so happy to be living the dream and teaching Jiu jitsu! 🙂 Stay tuned for more articles shortly and have a great week! This entry was posted on March 16, 2010 at 12:55 am and is filed under Uncategorized. You can follow any responses to this entry through the RSS 2.0 feed. You can leave a response, or trackback from your own site.